Successfully Added Portable Instant Cell Phone Battery Charger (Pink) to your Shopping Cart. 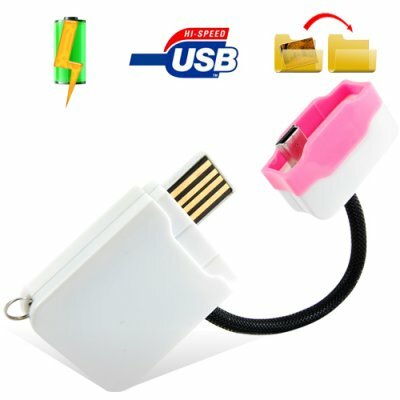 Keychain style instant cellphone battery charger that everyone with portable electronics should own. When you're out of power, this innovative device steps in to give you up to 12 more hours of cellphone time. Perfect when you're waiting for a really important call. Crucial when you're stuck in the middle of nowhere. Indispensable when you need help . Plus its pink and white exterior makes it a nice fashion accessory too. How's that for form and function? Part backup battery, part USB charging and part USB data transfer cable, this useful gadget hangs on your keychain or cellphone as a fob, unobtrusive and barely noticeable, until you need it. Say for example, you hear that familiar beeping sound and you look at the display of your mobile phone and see "Low Battery". Normally that would be cause for panic right? No longer with this instant cell phone battery charger. Simply plug it into your cellphone's mini-USB slot and bye bye low battery! Let's say you're at a computer and you need to charge your phone. Where did you put that mini-USB cable? Oh well, simply plug one end of this device into your cellphone's mini-USB port and the other end into your PC, laptop, notebook, or netbook USB slot and your cell phone will charge like usual. How about if you want to transfer data? No problem, you can easily transfer MP3s, MP4s, music, video, photos or other files from your PC to your cellphone or vice versa using the CVHF-G70. In fact, this amazing gadget isn't just a portable instant mobile phone battery charger, it's also a portable instant (digital camera, PDA, MP3 player, MP4 player, videogame player) battery charger. Such an absolutely useful product in such a wonderfullly small form factor (roughly the size of an iPod Shuffle). Get one for yourself and another for your daughter, your spouse, or your girlfriend. Sell them on their own or better yet, if you're a reseller get a couple dozen to sell as a bonus gift when your customers purchase a cellphone from you (like the CVDQ-M43, Quad Band Touchscreen Flip-Phone w/ Dual SIM, TV, Accelerometer). Just google "portable instant cell phone battery charger" and see how much these things sell for normally. Once your customers see that you're selling this device at such a low price, you'll have to hire some extra help just to process the orders! - When you have access to a PC, laptop, notebook, or netbook but a USB charging cable isn't available, this unit can act as a charging cable. - When you have access to a PC, laptop, notebook, or netbook but a USB transfer cable isn't available, this unit can act as a transfer cable. - When folded over on itself, the part of the body acts as a cap to protect the mini-USB and USB connectors from harm. Resellers: Here is a new revenue idea - Buy a few hundred units and sell it as a corporate premium. You have to admit, its usefulness and low cost make it great as a giveaway gift for trade shows, exhibitions, and conferences. Your customers will make a big impact by giving this away as a premium while you will have a new revenue stream that can potentially provide a nice profit for you while also allowing you to buy in bulk and save on product cost and shipping. Opportunities like this don't come every day, order your portable instant cellphone battery charger today from the leader in direct from China wholesale electronics - Chinavasion. You mentioned that this unit charges hand-held videogames too. Could you suggest some hand-helds since I'm looking for a good system? Why would I buy this when I can just buy an extra battery? First, an extra battery would cost almost 10 times more than this gadget. Second, it would be impossible to carry an extra battery around attached as a fob on your cellphone or keychain.